Welcome to the Restaurant Success Library! No matter the size of your restaurant staff, your need for great people to create a top notch customer experience can’t be overlooked. Some restaurants focus all of their time and energy on pleasing their guests, when at the heart of any memorable dining experience lies an even better team. After opening their doors just under a year ago, Maison Fou had set their sights on breaking the status quo for brasseries: instead of pursuing classic French cuisine, Maison Fou fused French cuisine with traditional dishes and flavors from former French colonies. And with a five star rating from blogTO, it seems their vision was a success. We sat down with Kevin to find out how Maison Fou achieves an impeccable guest experience with a “staff first” mentality. What’s So Special About the Staff at Maison Fou? Kevin let us know they’ve had the same staff since the day they opened. Clearly there’s something special going on here. This lack of friction amongst staff is a direct result of Maison Fou’s open forum concept. “We discuss any and all menu changes. From wines lists to menu items, we let our staff put their own spin on it. By taking and implementing their suggestions, they get to be a part of the whole package here.” Rather than viewing his staff as people who meet a job description, Kevin sees his staff at Maison Fou as ambassadors and partners. How Does It Translate to Guests? Kevin believes this fun and frictionless environment is to thank for being able to deliver more organic service, which can be captured in one Japanese word: omotenashi, which means to "entertain guests wholeheartedly." Kevin lives and breathes this term, as it directly translates to pure and organic hospitality – what the team at Maison Fou strives to achieve. Jackie is a Content Marketing Specialist and Social Media strategist at TouchBistro. She covers the latest food, dining, and technology trends for the restaurant industry. A lover of all things coffee, Jackie’s hobbies include breakfast, lunch and dinner. 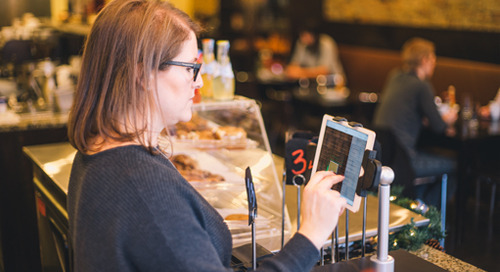 See how TouchBistro's reporting helped transform Le Café's menu. The right POS makes it easier to run your restaurant. Book a demo to see how. Opt-in to emails on industry tips, tricks & best practices. Yes, I have read and agree to TouchBistro's Privacy & Processing Policy. Yes, I am happy to have my data shared with TouchBistro selected partners and third parties. All you need to know. A glimpse into the future. Get answers to all your online ordering questions. Turn your food packaging into a competitive edge. The best ways to deal with the change. Avoid a storm in your restaurant. Become a payment processing expert. Watch that check size grow. Your blueprint for restaurant success! Inspire staff and diners alike! The ins and outs of payment processing companies. Get the best deal you can. Inform your menu prices with this key percentage. Get the info on this must-have permit.